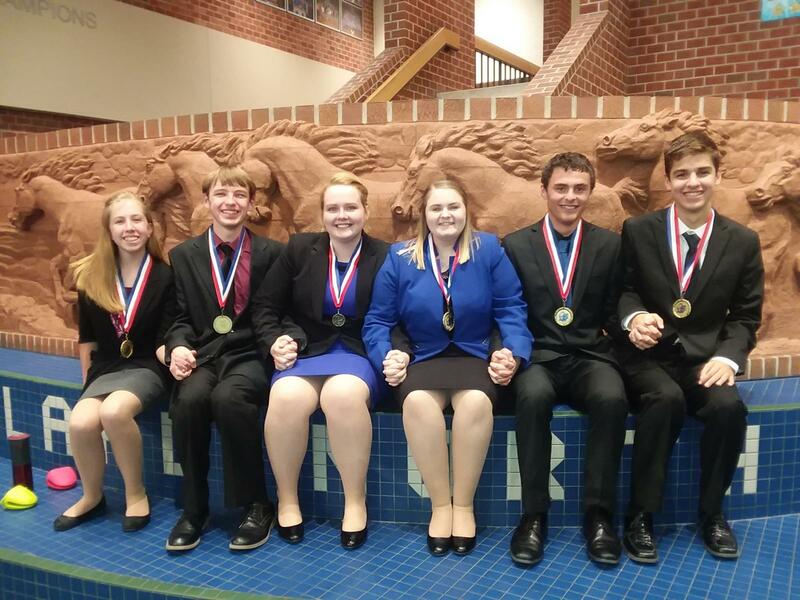 The Titan Talkers, NHS’s competition speech team has had a busy season and it’s only getting busier. The Talkers have competed at six meets since the season began in November. Twenty eight students in grades nine through twelve have competed this season. New members are led by returning seniors - Daniela Amaro, Tana Bond, Chris Boon, Davian Jones, Kate Millington, Cassie Morse- and a host of juniors and sophomores. Returning NSAA State medalists Kate Millington, Cassie Morse and Hunter Bond hope to reprise their success and take a lot of teammates with them to State this year in March. They are well on their way to that goal. Medalists this season include freshman Gionna Weber, sophomores Zack Faz, Maddie Starr, juniors Hunter DeBoer, Cagney Ehlers, Erin Tichota and seniors Daniela Amaro, Christopher Boon, Kate Millington, and Cassie Morse. The team is preparing for their last four regular season tournaments at Crete, Lincoln Northstar, Lincoln East and Norfolk. Then the post season meets begin with conference on February 16th hosted at Norris High School; NSAA districts and state follow along with the NSDA National Qualifiers tournament. The Talkers will be represented at the National Individual Events Tournament of Champions by qualifiers Kate Millington, Cassie Morse and Maddie Starr. Others may still qualify for this national tournament hosted by Millard North in May of this season. The National Speech and Debate Association National Tournament takes place in Dallas this June; students who place first or second in the Qualifiers Tournament will be eligible to attend.